Sometimes doing the right thing isn’t obvious or easy, but one group hopes to help educate and bring together those dedicated to finding the right choice. Doing business right, above board, openly, without tricks and in good faith — that’s the mission of the Above Board Chamber of Florida, which aims at bringing together business owners of faith, of any faith – even if only faith in oneself. Above Board held its monthly meeting Monday at the Hilton Naples, where about 40 members listened to the secrets of closing a sale presented by a panel of experts. Jeanne Sweeney, president and founder, said the main goal of the 90-member group is to do business right. She asks every member to ask themselves before doing something if it’s being done above board. Non-profit organizations are invited to set up a table at every meeting free of charge. Sweeney said these groups are sometimes overlooked in the community and deserve a larger presence. “We take the invisible and make them visible,” she said. Ingrid Molina, a solution specialist with Fuller Online Solutions, said she was at the first meeting of the group about a year and a half ago, but what made her join the group was that the group stresses integrity and being helpful, she said. “There are always people here helping you meet other people, and there are people here who really want you to succeed,” Molina said. Kelly Capolino, a real estate agent with Keating Associates, said she’s part of the group because of the educational benefits that goes along with being a member. “You walk away with something, or someone in the group gives you a breath of fresh air in a crazy business day,” she said. While networking is a part of any chamber, Sweeney said Above Board isn’t just about networking. The group is more about educating and doing business the right way, she said. “My job is when they leave this meeting each month, that they’re a better business person,” Sweeney said. At every meeting, a panel of experts discusses a topic related to business. Monday, the discussion turned to how to make a sale. 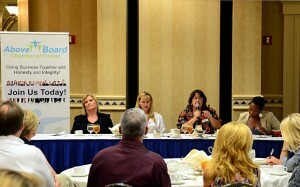 The panel included: Trudy Stemen, sales consultant at Paychex; Lisa Sparks, regional development director at Constant Contact; Heather Stone, insurance agent at American General Life and Accident Insurance Company; and Karen Moore, publisher at Southwest Florida Business Today. Each panelist had their own experiences and own expertise, but each agreed that to be successful at sales requires more than spouting facts about the products or services. Stone said ditch the elevator speech and listen more. “Sales is 80 percent listening, 20 percent talking,” she said. Stone said the key to closing is developing relationships. A sales person needs to know what their client needs. She said oftentimes, the staff of a company she has targeted knows her as the muffin girl, because she brings muffins every time she visits. Stone also said to act like a 4-year-old, be persistent and always stay in contact. “No doesn’t mean no, it means not right now,” she said. For Stemen, the most important part of sales is finding the right prospects, but first a sales person must set goals. “We have a blank check in front of us and it’s our job to fill out the blank,” she said. “That starts by setting specific goals.” She said sales people can’t make a sale if the person they are pitching doesn’t need the product. within the schedule of clients. Moore has found the best times to reach a particularly hard to reach person is between 8 and 8:15 a.m. and between 5 and 5:15 p.m. because business owners arrive early and leave late. “Be creative with how you reach your clients, and remember it’s all about their schedule and not yours,” she said. Sparks said there’s nothing worse than hearing from a small business owner that everyone is their client. Only a targeted group should be their client, she said. Sparks said to have success requires specific targeting and consistency in message. “A friend of mine says, ‘The riches are in the niches,’” she said. While many times, panels are experts brought in from outside the group, at the meeting on Monday, three of the four panelists were members of the Chamber. “We all work together and that works out very, very well,” Sweeney said.